This is not really dog related, but as we have just put out our first ever Animal Welfare Special (March/April 2008 edition), I thought it's good timing. 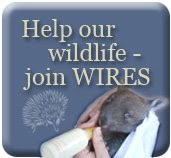 Jilea is also the editor of a new publication LiveWIRES which looks at every aspect of the care of injured and orphaned wildlife. Keeping your dog away from areas where there are native animals is essential. You can find out more information about why dogs and wildlife don't mix by reading Jilea's article "Dogs Not Allowed! Protecting the Natural Environment" in the #85 Sept/Oct 2007 edition of Dogs Life.